This jacket is made from Marmot’s latest fabric, NanoPro Membrain, which boasts excellent breathability in the lab and in my experience is one of the best 2.5-layer fabrics available for controlling condensation on the hill. It comes in men’s and women’s version called the Artemis and Adroit respectively. The jacket has a good water-resistant zip up the front with an internal flap to manage wind and water leaks through it. There are pit zips too for added control of condensation. There are just two outside pockets but these are huge and extend up most of the side of the jacket so you can easily access them and easily store maps in them. The drawback is that they’re mesh and the pocket bag extends to the hem, meaning retrieving items from them can be a chore – but at least the pocket zips are well-placed. The hood is reasonably well-designed with a stiffened peak that has a small soft wire in it, so it can be reformed if it becomes bent in the rucksack. The hood also fits on the head and moves easily to allow good vision. All that for 332g (size men’s large) is very good and a slight tweak to those pockets would make the Marmot Artemis/Adroit an excellent option, but with a price tag of £200 other jackets are slightly better in my view for hillwalking. 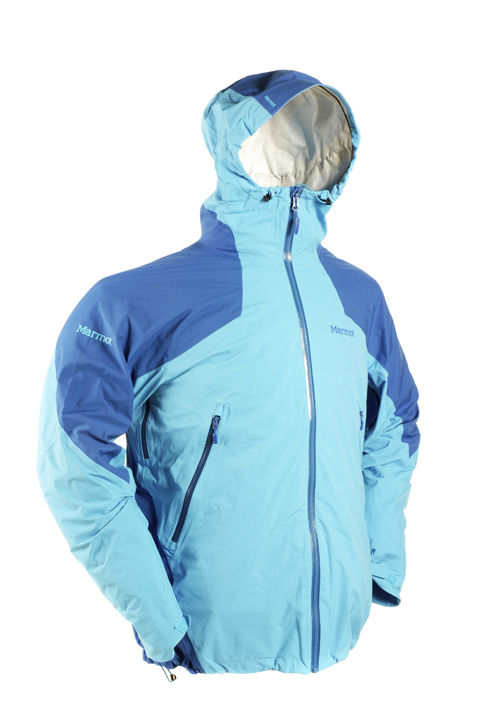 The Marmot Artemis/Adroit’s fabric, hood and weight are great but I’d want slightly better pockets to guarantee my purchase of this jacket at £200.